The fundamental premise of this article (The Tyranny of the Retiree, NR September 11, 2006) is based largely upon the upward (right) slope of the curve below, Chart 1, which shows that with advancing age from 0 to 90 (left to right), the per capita consumption of goods and services is clearly in favor of the elderly. Older folks consume more than younger folks, as shown in the following chart. This would appear to be an indisputable fact. Exactly how it follows that this data on consumption confirms an “enormous redistribution of wealth” from youth to the retiree is a preposterous conclusion based upon the same data. Then it occurred to me, by applying Marxist philosophy, that all resources should be distributed equally among all the people. A chart of consumption would then be a flat line across all age groups. Accepting this, it follows that those with greater consumption must have stolen their advantage from those with less. 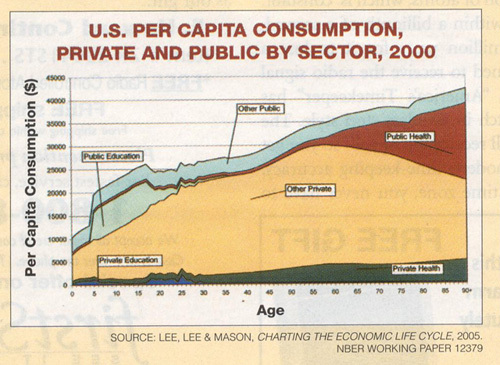 The older folks, the retirees as shown on the right in the chart, have succeeded in this alleged economic tyranny. Grandma and grandpa have been caught with their hands deep in the cookie jar, and their tyranny should be acknowledged through publication in National Review. Surprisingly National Review complies by publishing this indictment of the nation’s elders. The charge of tyranny is not only serious, but is presented with supporting data, most of which the average person will not read, for perfectly good reasons. In the face of such charges, I elected to probe more deeply into the data, and viola! I uncovered pure validation of even more heinous crimes! Applying the same principle, that “more wealth” is evil, I found a serious discrepancy in the consumption of brothers, the 5 and the 15 year olds. The 5-year-old brother shows a whopping $20,000 consumption, while his 15 year old brother has a phenomenal $25,000 in annual consumption. As the alleged extortion is perpetrated by those higher on the curve, the older brother, like his elders, has clearly stolen $5,000 from his innocent pre-school age brother, the poor little guy. Even more startling is the 5-year-old, a precocious child. Of his $20,000 consumption, he extracted half of this, $10,000, from his baby sister on the day of her birth, or earlier! Talk about robbing the cradle! While his older brother stole $5,000 from him, he stole $10,000 from his baby sister. This theft must run through all generations, as the entire curve slants uphill to the right. Unlike water, wealth flows uphill! Without additional interpretation, this becomes the foundation for an entirely new economic theory, the “Trickle-up Theory”. Amazing! Being unable to believe this fascinating discovery, I pondered these two unusually rich brothers. Where, exactly, on the curve did they get their amazing $45,000 in annual consumption. As their support must come from their elders who work, located higher up the age chart, it would seem that wealth, in this case, actually flows down the curve, like water, from those with funds to those without funds. This produces a perplexing dilemma. We now know that wealth flows up hill to grandma and grandpa, who are tyrants in their retirement, and down hill to these otherwise destitute children. In a nut shell, this discovery defines a new law of economics, which I prefer to call Grandpa’s Shell Game Economics. Wealth, like water, is fully capable of flowing in any direction, which we all know to be the case. What is new is that on a chart of consumption, water has an additional capability; it can flow both up hill and down hill on the same chart. In other words, water, like wealth, has a mind of its own, and can flow around a chart of consumption anywhere it wants to flow. Up hill or down hill really doesn’t matter. Being startled by such revelations, I considered what other analysis might shed light upon this perplexing circumstance, and again I was not disappointed. Mixing a pinch of knowledge with a sprinkle of common sense, I noted that one important dimension was missing from the data. Knowing that both grandma and grandpa have their heads on a chopping block, such desperate times call for desperate measures. I proceeded to sort the data one more time. This time I sorted consumption by gender, placing grandpa on the left, and grandma on the right. Their per capita consumption is shown in chart 2 below. This chart shows what grandpa has suspected for some time. There is a serious redistribution of wealth, as shown in this data, from grandpa to grandma, leaving the poor old guy holding the short end of the stick. Grandma is responsible for a full 70+% of the family’s annual consumption, while grandpa gets what is left over. This illustrates, through additional data analysis, that the author is “spot-on” accurate in one very narrow respect. The high point of the chart, in this case grandma’s consumption, certainly raises suspicion that tyrannical influence has been applied, and a victim must be around close by. What’s more, grandma repeats this crime year after year, and smiles all the way to the mall. One additional revelation has also sneaked into the analysis, which some folks will recognize. As both grandma and grandpa are the same age, this essentially debunks the notion that age is related in any direct way to the tyrannical economic extortion by retirees. It remains, however, that grandma, through her wily ways and years of perfecting stealth and cunning, may remain a suspect in an extortion ring. Grandpa’s only consolation is that he has been taken off the hook completely, and we have identified grandma as a possible kingpin in some nefarious conspiracy. Had grandpa not applied the additional data sorting by gender, grandma’s alleged crime might have gone undetected for several more decades. All this proof by projecting meaning into numbers makes grandpa worry about what he thought he already knew. Grandpa always said that if they had all the money that grandma spends, they would be wealthy. He knows very well that whatever wealth he gives to grandma disappears like it fell into an eternal abyss, a virtual black hole. Fact is that if grandma and grandpa were wealthy, grandma would have that, too! That would be a magnificent redistribution of wealth, but it fails to rise to the level of tyrannical economic extortion, a crime that grandma is alleged to commit each and every year. Grandma, at least, should be ashamed! Grandpa also worries that what is called wealth in all the above allegations and assertions is still just plain consumption, and that real wealth is not on display anywhere in the charts. If this is the case, as grandpa believes it is, then economists should not be allowed to see, nor interpret charts on consumption. Economists should all be ashamed. Enormous redistribution of wealth! Poppycock! Finally we come to the piece published in National Review. This legacy to the contemporary conservative, William F. Buckley, printed the entire article, complete with chart, within a buff-yellow highlighted background, the outline of which may be seen around the edge of the chart I scanned directly from the journal. This yellow highlight was what initially caught my attention, and eventually brought me back to study the presentation in detail. This marketing gimmick worked like a charm, and clearly illustrates the awesome power of yellow journalism. National Review should be ashamed! I am not sure about WFB. As a former retiree he may be one of us!